What’s good about our slow economy? What’s good about being in the middle of a recession? The upside is that it’s a buyers market for collectibles. Prices have never been lower and now’s the time to start or add to your collection. 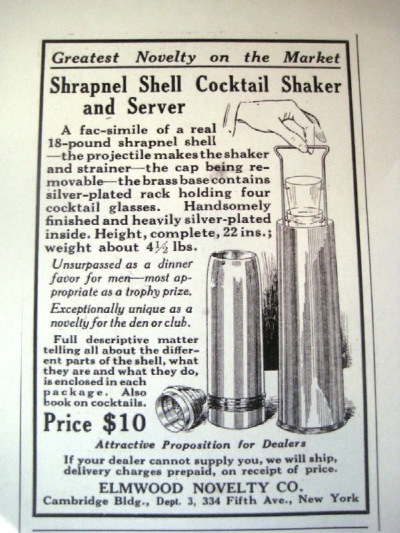 At one time almost every family in American had a cocktail shaker in the china cabinet, so there are plenty available. There’s a price range for every collector, starting in the $25-$35 dollar range for a mass-produced design in glass or chrome, to several thousand dollars for a rare designer item. Design; Figural designs such as shakers in the form of zeppelin, golf bag, lighthouse, dumbbell, penguin or lady’s leg are the most valued by collectors. Skyscraper style cocktail shakers are another popular form. Manufacturers; Look for those by International Silver Co & Manning Bowman. Pre-market crash (1929) are more valued than those made after this date. Collectors look for Revere & Chase produced in the 1930’s. In glass those made by Cambridge & Hawkes are in high demand. Cost; Rarer finds by designers like Norman Bel Geddes, Russel Wright, Kem Weber or Lurelle Guild can run into thousands of dollars. Condition; It’s all about condition, condition, and condition. Shakers in good condition will increase in value, while those in poor condition or with dents and missing tops will not. The only reason for buying a damaged shaker is when it has a good clean top that you can use on another shaker. Damage; Dents, scratches, and flakes, all lower value. Chips.. examine a glass cocktail shaker closely, running your finger over the rim and bottom edge. A small chip can reduce the value by 30 percent or more. Ask; when buying on e bay, if condition is not fully listed, ASK! any digs? Any dents? scratches? condition? anything missing? any repairs? Ask if there are any splits in the top cap or spout, these are from metal fatigue when cold forming and are common in vintage shakers and lower the price. Dull Color; When buying colored glass, the more brilliant the hue, the higher the value. Look for bright clear colors in the glass. Cobalt glass was difficult to make and thus commands the highest prices. Reproductions; Be sure you’re buying an authentic piece. Get to know the types of shakers produced by major vintage manufactures. Restoration Hardware is making shakers today in the form of zeppelins, airplanes, penguins, and we see them on e bay selling for hundreds of dollars, when they should be selling for $29.95. To Good to Be True; Don’t buy an e bay item off line. You can make someone an offer to buy off line, or they make you an offer. You send them two thousand dollars for a six thousand dollar cocktail shaker and never receive the shaker. Don’t let this happen to you. E Bay is not the only source for vintage cocktail shakers. Try antique stores, garage sales and flea markets. In going to flea markets get there early; at set up time for the best buys. On Line; There are some great specialty sites with more than fair prices, try; www.thejazzage.com or www.cocktailshakes.com or punch up art deco stores, they usually have a few cocktail shakers in inventory. If your cocktail shaker or vintage bar ware item has a patent number on the bottom you can easily find and print out a copy of he original patent. All thanks to Google who uploaded seven million patents on their site. Just punch up “google & patents”. If you ever tried to search on the government patent site you will be amazed to see how easy this is on the google site. Many bartenders have achieved celebrity status in the world outside their own saloon as authors of cocktail recipe books. These books by master mixologists reach out across time and space and speak to us in the printed word. They speak to us of professionalism in bar service and the finer points of tavern etiquette and deportment, while shaping and setting the standards of drink mixing, service and ambience for future generations of bar keepers. Today, this ability to look back into a portal of history and hear the words of an innovator bartender make vintage cocktail books one of the most rewarding and sought after collectibles in bar ware. One of the most prized books and generally recognized as the first cocktail recipe book, The Bon Vivant’s Companion or How to Mix Drinks, by Jerry Thomas, was published in 1862, and quickly went through a half dozen large printings. Thomas the greatest drink mixer of the day, toured Europe in 1859 with his custom made sterling silver bar utensils valued at four thousand dollars and astounded all with his virtuosity. Acknowledged today as the inventor of the Martini, he was famous for the invention of the Tom and Jerry Cocktail and the celebrated Blue Blazer, the latter a concoction of equal parts scotch whiskey and boiling water, set ablaze and poured from one mug to another. A generation later in 1891 William Schmidt, a New York City bartender, often called the master of bar service, and credited with inventing the Manhattan, published his book The Flowing Bowl, What and When to Drink. Besides drink recipes it espoused the art of service and cocktail decorum and for years served as the training manual of the tavern industry. Published in 1930, The Savoy Cocktail Book by Harry Craddock is valued by collectors for its’ racy cover, as much as for its recipes and words of wisdom. The cover traces the path of a cocktail with a lighting bolt, from the drinker’s lips, to his brain, then to his heart and on downward. A first edition of this swell little book can be found for around two hundred dollars. It was reprinted in 1976, 1983 and 1999 and these copies can be had for twelve to twenty five dollars. With the Repeal of Prohibition, in 1933, a plethora of mixer’s manuals came on the market, reproduced vintage cocktail books and new ones met the demand for the drinking crowd. Today they’re easily found in all price ranges and will enhance and round out any display of vintage bar ware. The Post-War Martini Craze help produce, in 1951, a recipe book sought by many collectors, it’s the Bottoms Up by Ted Saucier, with elaborate cover design, by Al Dorne, of a naked girl in a cocktail glass. Saucier provides recipes, toasts, and tippling tips, but more significant are the erotica illustrations by eleven of “America’s Most Distinguished Artists”. They’re all done in the naughty Vargas Style of the era. A search on abebooks.com turned up 29 books ranging from twenty five to forty five dollars, a great look back into the Fifty’s. It’s always been fun to hit the antiquarian book sellers when visiting a new city on vacation or business, but today it’s just as easy to build a collection, without leaving home, from cyberspace. The big daddy of garage sales E Bay.com always has an ever changing list of cocktail books for sale, and book sites such as abebooks.com will find you copies of your favorite cocktail book world wide, listing stores and prices. Starting a collection has never been as easy as this before, see you on the web. The words of William Schmidt, published in 1892, have served generations of bartenders elevating the craft of professional service conduct behind the bar. Today Schmidt’s ideas remain as fresh and innovative as they were over a century ago.